Home News OTR Neighborhood Holiday Party – Thursday Night! OTR Neighborhood Holiday Party – Thursday Night! 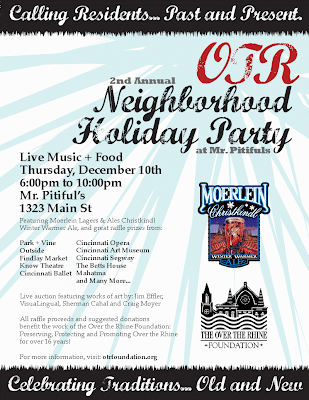 The 2nd Annual OTR Neighborhood Holiday Party will feature live music from local favorites Messerly & Ewing, food, and of course spirits featuring Christian Moerlein’s Christkindl Winter Warmer Ale. The party gets started at 6pm Thursday evening and is slated to run until 10pm, but you have to figure that will be just about the earliest anyone heads home. Next articleBrian Kelly decides to jump ship…NEXT MAN IN!